The Orthodox Jewish man wearing the hat, identified only as Victor, told NBC Bay Area that Mankey called him a Nazi. Palo Alto, CA - A woman who said she confronted a man for wearing a red “Make America Great Again” hat inside a Palo Alto Starbucks was fired from her job at a nearby music store. A day later, Palo Alto music store Gryphon Strings announced that Mankey had lost her job. 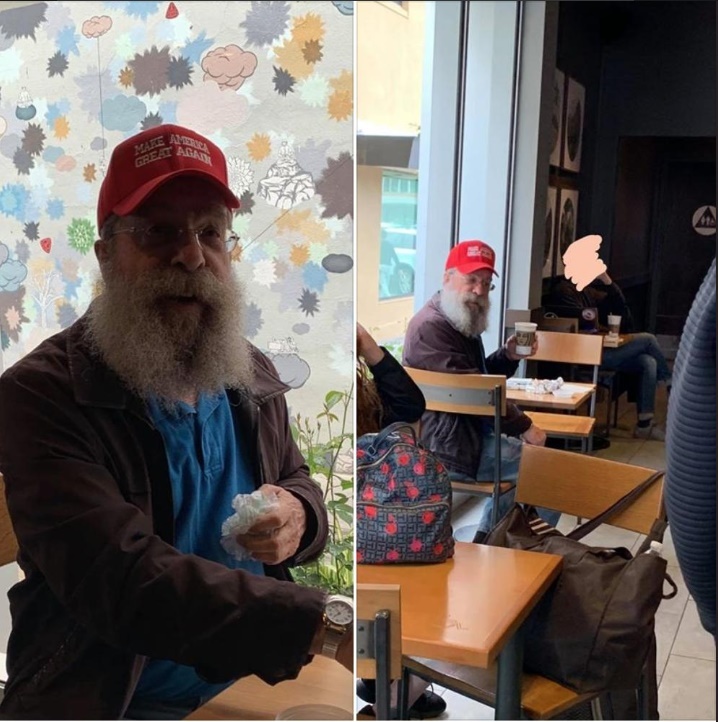 The man wearing the hat, identified only as Victor, told NBC Bay Area that Mankey called him a “Nazi” and tried to get other Starbucks customers to shame him. In her Facebook post, Mankey wrote that Victor threatened to call the cops, and said she encouraged him to do so. “[I] Wanted him to call the police because I wanted to know his name, where he lived, his wife’s name, and where kids went to school,” she wrote. Mankey, who said she was “born and bred” in Palo Alto, told the Palo Alto Weekly that she and her family have received death threats after the incident. Yidden, while I support free speech, a little common sense should be shown. It is against Halacha to place one's life in danger. This incident could have ended far worse for the gentleman wearing the MAGA hat. Therefore, one should not go anywhere alone wearing that hat. There are all sorts of mishagoyim out there, who are just looking for trouble. The lesbian who caused the commotion, seemed only concerned with her rights, but not with the rights of others. SICK!! Well, Rebecca Parker Monkey did accomplish getting SOMEONE fired because of the MAGA hat! deranged democrat hypocrite wanted to find out who and where this guy was and lived so he could be harassed by leftist fascists now she is being harassed well mida k'neged mida. She went too far. Both sides go too far. The United States is DEAD! The social services should investigate whether she is fit to look after children if she has any. Probably they should be put into care. Their mother is mentally unstable. Unless they are related it is none of her d--- business if an old man wants to make a fool of himself. 1) Stop hiding behind " Anonymous"
2) This is America- Yes Jews need to be of all the hate out there, but should you not wear a Yarmulke because of Hate ? Should you change your name to an Anglo name to hide your Jewishness ? Yes , Jews have to be aware of the hate and Anti-Semitism, , but we can't be afraid of it. WE HAVE TO FACE IT HEAD-ON, CONFRONT IT, FIGHT IT AND CRUSH IT !! Only she is allowed to open her sewer mouth !!!!! Her mother never washed her mouth out with soap !!!! People can very well say the same thing when looking at pictures of religious Jews. We are proud of him. The old man didn't make a fool of anyone. And you have some nerve disrespecting your elders. Learn derech eretz. Old men are wiser and smarter than you. They know who is good for klal yisroel. Fake News. You can't be orthodox (Jew) and wear a MAGA hat. Brown shirt? No Payes? Liong beard. Orthodox??? Proud of him? with a brown shirt. How old are You? Do you know who wears Brown shirts? Nazis. Just ask any adult. #9 is the reincarcerated 'hashomer' aka anti semite. his new user name fools no one. he wants to rile us up. unless he posts his true name, the old bag needs to be ignored. MAGA = Jews and dogs are not allowed. (Great Again, like in the old days) should be outlawed. MAGA hat with Brown Shirt is a very dangerous combination. There are no good people a both sides. This is a first when even the biggest pro-Trump EDUCATED is not in the first 18 posts. He must know the meaning of Brown-Shirts so he respectfully stays out of this. Seems Maxine Waters' call to publicly harass people she disagrees with keeps on bearing more fruit. You assume he is older than me. He may have grown old but he obviously didn't grow smarter or he wouldn't advertise his support for the sexual predator in chief. Gays of both sexes, who claim to be discriminated against, can be just as discriminatory, biased, and violent, as straight people. This incident was a perfect example. If Victor had removed his hat, and the lesbian would have seen his kippah, there is no doubt in my mind that her sewer mouth would have unleashed the vilest anti-semitic invectives against him. He should have called the cops. “ You assume he is older than me. Why not mordecha Hatzadik supported a sexual predator in public too? Achshaverosh wasn't any better. He even killed women who didn't show off their sexuality to all. POS it's your beloved fascist democrats who want to ban anyone who is pro Israel or anti toevah marriage from campuses nationwide. NY governor want to ban anyone who doesn't support toevah marriage and abortion on demand from the state. Someone shaving their head and leaving a Mohawk is a freak especially a deranged leftist democrat. He is a weirdo who gets stuck on piety nonsense.